It’s time for Christmas fellowship! 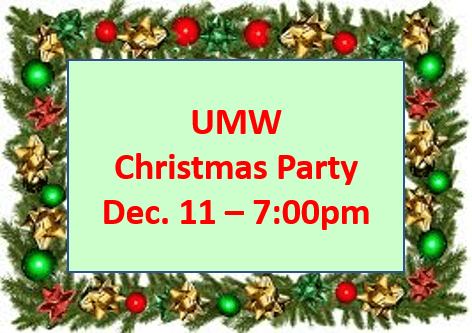 United Methodist Women have scheduled their annual Christmas dinner on Tuesday, December 11th, at 7:00pm at Lamberti’s Ristorante, 7701 N. MacArthur Blvd., in Irving. Come and join in on this very special event! Members: $15 Non-members: $16. Money due to Melba Dobbins or Cindy Pierce by December 3rd..